Last week's announcement of Heroku Connect Demo Edition prompted me to take Heroku Connect for a test drive. It took me just a couple of hours to build a Node.js app on Heroku that would monitor tweets and synchronize them back to Salesforce. Here's how. I fired up a Heroku app via the Heroku Connect Demo Edition button, and quickly added mappings for Contact and Campaign. 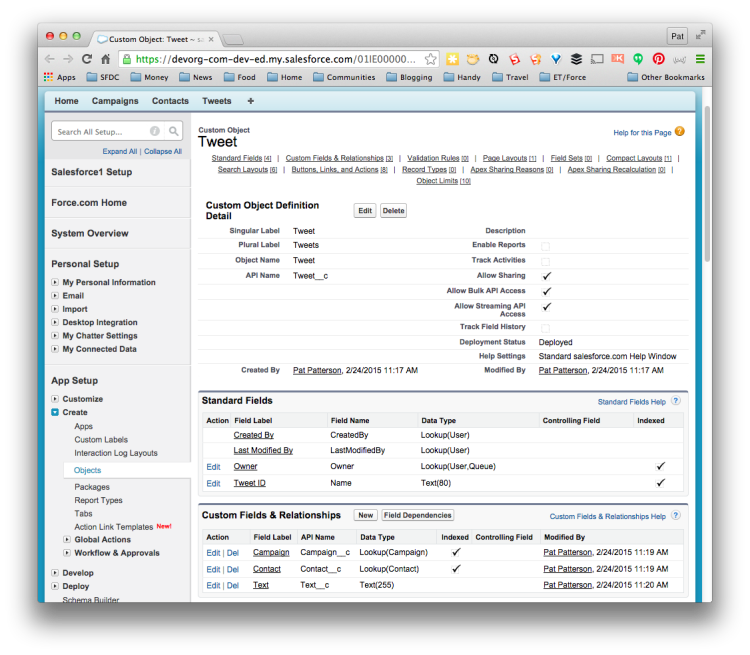 In a few seconds, I could see my Salesforce data synchronized into Postgres. I modified my app to use the Postgres Node module to read Contacts and Campaigns, building a filter for the Twitter Streaming API call, and logging matching tweets to the console. A quick test confirmed that all was working. 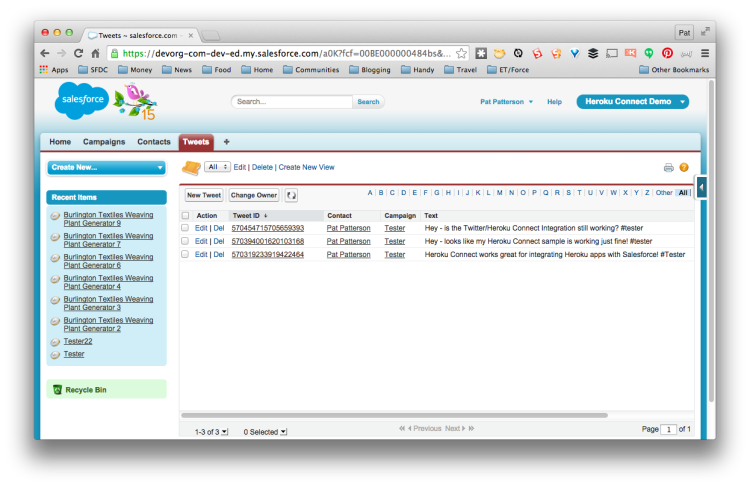 Now the question was, how to get the tweets into Salesforce. 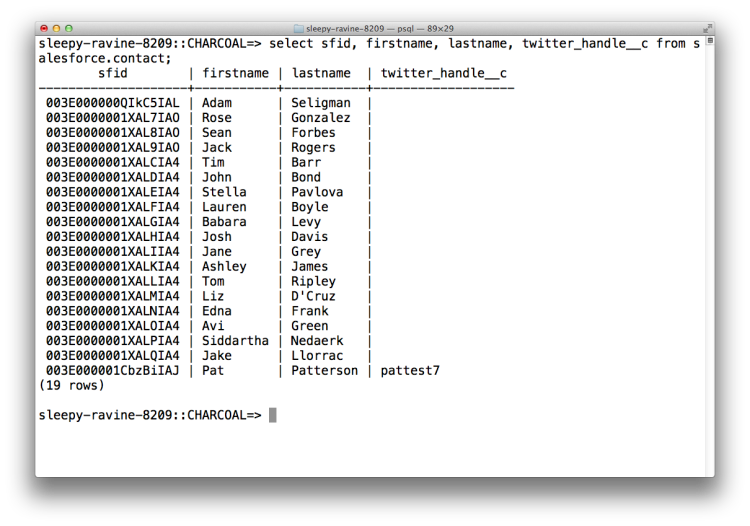 I considered creating a Postgres table and using Heroku External Objects with Lightning Connect, but I realized there was a much simpler route: create a Tweet custom object in Salesforce with lookups to Contact and Campaign and a text field for the tweet content, and let Heroku Connect do the heavy lifting. Since Heroku Connect provides full, bidirectional synchronization, I could map the Tweet custom object to a Postgres table and simply insert records from my Node app. Heroku Connect took care of synchronizing the data back into Salesforce, and soon I could see tweets in their own list view, and on related lists for both Contact and Campaign. Try it out yourself, today! It’s easy to get started with Heroku Connect Demo Edition. If you have a Heroku account and Salesforce Developer Edition, all you need to do is click the Heroku Button below. In a couple of minutes you’ll be synchronizing your Salesforce data into Postgres on Heroku, ready for your killer application.